Many people consider homesteading and prepping to be two different things, when they are actually quite similar. Sure, the path of each community is distinctly different, but the end goal is the same: survival. Homesteaders know that they need to prepare for the winter, make sure they have a lot of food on hand in case they’re snowed in, and they also need to provide plenty of food and resources to keep their family and animals healthy, happy, and well fed. The remote locations of most homesteads make access to services and outside resources difficult. So in many cases they must be able to provide for themselves. Preppers are generally urban, suburban, or city-dwellers who believe the likelihood of a disaster of some kind exists and make active preparations to survive through it. In times of uncertainty, in the event of a natural disaster, or a complete economic breakdown it’s important to know that you and your family have enough food and water to get by, as well as having the ability to stay safe and sound. Heavily populated areas have an added danger of panic and hysteria amid disaster as food and water resources have potential to dwindle over time. At a glance, these two lifestyles seem worlds apart. But in practice, their mindsets are very similar. Homesteaders prepare for the worst in the same sort of way that preppers do. Although they may not necessarily buy they foods that can be stored for years at a time, they do preserve and start canning foods so that it’s available throughout the year. Having land as a resource provides homesteaders with an opportunity to be self-sufficient when it comes to food. For example, if you grow a lot of peaches, squash or leafy greens on your land, and you have too many to sell or give away, are you going to throw them in the trash? Absolutely not. Instead, you’re going to preserve the excess so it can be enjoyed later in the year. Canning, fermenting, preserving and dehydrating are all good methods of preparing food to eat at a later date. This form of self-sufficiency was born out of necessity as farmers needed ways to survive through winter without access to year-round fresh produce found in today’s convenience stores. Modern homesteaders who to live off the beaten path provide their own convenience through canning. Check out this guide on pressure canning. Preppers often buy dried meals in so that they can be eaten at a later date. Although many preppers will not start canning foods, some do, and this makes their activities very similar to homesteaders’. For example, there’s a resurgence in several small communities to allow raising chickens and many urban preppers convert grassy yards to raised garden beds. The economic benefits of urban or city life provides a challenge and a choice: endure mass populations for a healthy paycheck, or take a pay cut or longer commute to live the homesteading lifestyle. For those with a prepper mindset who live in heavily populated areas, the need for preparation is just as great as a homesteader. Taking steps to store food, water and other provisions allows preppers to endure most disasters in stride compared to neighbors who are unprepared. Some people disagree with me that homesteading and prepping are two different things. Preppers are often viewed in a negative light. Their aversion to government, coupled with a fear of their normal life shifting because of outside influences tends to put them at odds with the norm. As a result, their actions and activities related to prepping are seen as extreme or unwarranted. Homesteaders are often seen as outcasts shunning city life for something far more remote and understandably more difficult. The choice to live remotely among chickens, pigs, goats, and other livestock, or to fumble in the dirt or make soaps and commodities from scratch, seems like a waste of time and energy to those who prefer the ease and accessibility of a farmer’s market or grocery store. These two groups are polar opposites when compared to the typical urbanite or city dweller who sees no reason to fear for the future, or to work for food that can be just as easily picked up from the store, or to be prepared for more than the next day or two. But when preppers and homesteaders are compared to each other, the similarities start to emerge. Preppers and homesteaders are different in some ways, but they share several of the same attributes along the survival spectrum. Aside from physical location and resources, many aspects of preparedness and homesteading are similar. The methods of preppers and homesteaders are very similar. It doesn’t matter where you get your products from, or whether you make them yourself, you’re saving food, water and other products so they can be used at a later date. Preppers can take advantage of bulk purchases or sales while homesteaders can save by generating their own food and practicing self-sufficiency. Power outages, storms and natural disasters have no discretion. So, when an event disrupts everyday life, the prepper and the homesteader become one in the same. They reach for their lights when the power is out, they fire up the generators, they filter water so it is safe to drink. Having backups is a staple of homesteading and prepping. Extra food, extra gear, extra cash on hand, extra power sources – all these things are designed to allow both prepper and homesteader a stop-gap until things return to normal. While the threats may be different, the methods and mindset to endure are the same. One big difference between homesteading and prepping, is that homesteaders tend to use a lot of what they have in stock. Preppers keep long-term food stores and rotate their stock only when it’s about to expire, or in the event of an emergency situation. 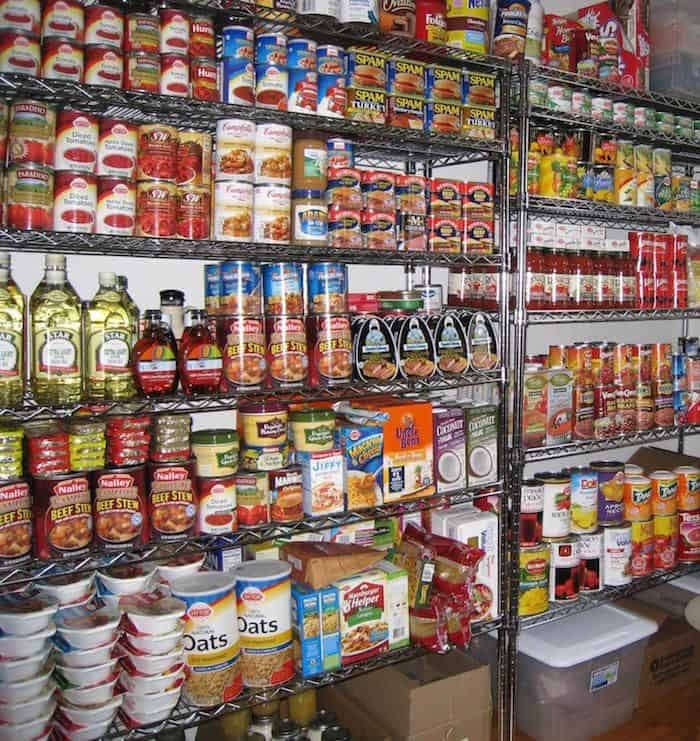 It’s highly unlikely that you’ll find a prepper in his basement, searching through the goods and wondering what they could have for dinner. Homesteaders on the other hand will look through what they have in the pantry, and they will plan to enjoy some of it for everyday meals. They stock things up so that they can be used through-out the fall, winter and spring when fresh food is limited. Food rotation is a critical part of food storage that is often neglected. Both preppers and homesteaders alike will work to consume the foods they have stored where others might forget and allow foods to go to waste. Being mindful of food stores and using up stock on hand is a matter of being resourceful while still keeping some in reserve. A similar approach is taken with regard to fuel stores, heating sources like firewood, and commodities like soaps or paper towels. As these things are used up, they are replaced and stockpiled for future use. Both preppers and homesteaders keep firearms at the ready. Not only will both groups of people use firearms as a means of defending themselves, but it’s likely that they will also use them as a means of hunting for food. Avid hunters harvest a kill and preserve it in a chest freezer. Preppers with a hunting mindset intend to do the same should the worst happen. Homesteaders use firearms as a form of security against wildlife threats that would otherwise destroy their way of life. They are also used for putting down livestock and self-defense against strangers who might be looking at an opportunity to do harm on a small farm. Some homesteaders frequently go out and hunt animals so they can enjoy eating meat without cutting into their flocks. In most instances, urban preppers have a little experience hunting for food, but for the most part, they have the firearms on standby should they need to hunt for food in a SHTF situation. As a form of self-defense, preppers keep firearms on hand to protect their resources and their families safe against human threats. In both cases, firearms are viewed as a tool just like any other. 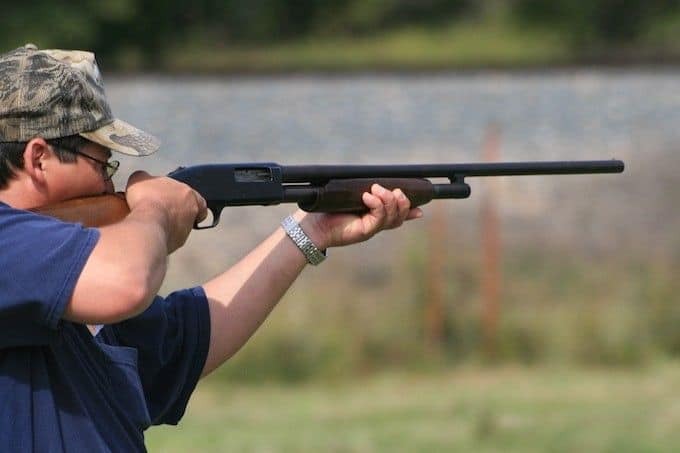 Keeping firearms and ammunition is another way preppers and homesteaders stave off threats that could come their way while providing a means for survival if hunting becomes a new way of life. In the event of a SHTF situation, who do you think is more likely to be secure? It’s fair to say that a lot of preppers take steps to ensure they have a backup location in that is difficult to infiltrate – a bunker, a safe room, a hideout or bug-out location. For those who don’t intend to leave, a secure room that the family can comfortably live in, coupled with firearms and some self-defense skills can make preppers the type of people that you don’t want to cross. Homesteaders may themselves be security experts, as they may have experience when it comes to dealing with someone or something trespassing on their land. The rarity of trespassers often provides a false sense of security to homesteaders. 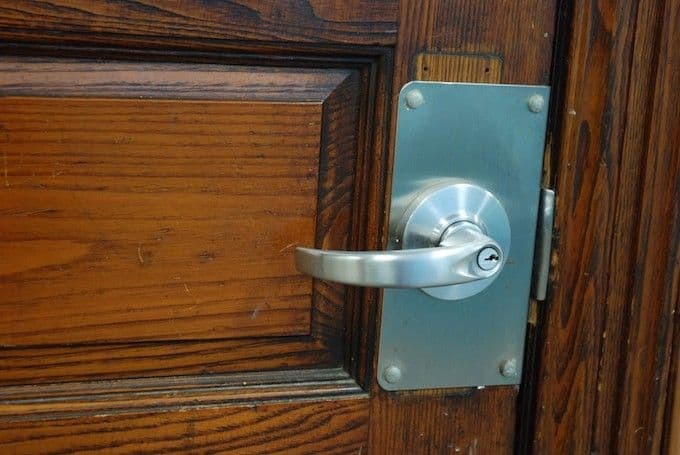 In some cases, doors are left unlocked and equipment or supplies are left unattended and accessible. On the other hand, the lack of foot traffic and the unannounced visitor piques awareness in the moment when someone steps on their land. If not fully aware, the homesteader can be caught off guard to a threat that most preppers would be ready for: human nature. The more land you have, the more space you have to watch and protect. A safe room, bunker or hideout may have only one access point where a homestead may have several approaches to watch for. Although homesteaders are usually experts at preserving food, it is fair to say that preppers are more likely to be a little more security conscious when it comes to home invasions and trespassing. For both preppers and homesteaders, keeping themselves and their family safe is vital in an emergency situation but the means and methods for doing so are vastly different. In the event of a long-term emergency situation, who would fare better? Would the well-armed and well-stocked prepper who has the occasional practice drill be more likely to survive? Would the homesteader who uses firearms frequently, and knows exactly how to keep plants and animals alive be the one to survive? Each within their own environment stands to outlast the average individual living day-to-day. It’s hard for us to say exactly who would be better off in this situation, but it is likely to be the homesteader. My reasoning is this: many homesteaders practice survival techniques on a daily basis. From splitting wood to food preservation and animal husbandry, the homesteader is actively practicing the survival skills most preppers will need to learn to endure. Whether they look at that the butter they are churning and the foods they are canning as survival techniques or not, homesteaders are constantly engaged in their own long-term survival. Although they may not have as much food in stock as a prepper might, they will be psychologically stronger than the prepper who has no experience handling livestock or growing and preserving food, which can make a big difference. You can fill your home with food and water for an emergency, but if the situation is too stressful, you’re still at risk of failure. Anyone who has lived on a homestead for more than a year will understand how tough this kind of life can be. You are constantly trying to store water, feed your family and keep your livestock and crops healthy. This means early mornings, late nights, life outside in all forms of weather, and constant worry when away from the homestead. Keeping plants and animals alive is an everyday challenge. It requires a significant amount of time, energy and willpower. Many preppers who have never had to harvest an animal may find it difficult or impossible. Those who are out of shape may not be able to swing an axe or till the soil. And isolation can have a daunting negative effect on one’s will to survive. This active lifestyle and preparedness in practice leads me to believe that homesteaders may in some cases be better prepared for everyday survival without modern convenience. I do however, still consider homesteading and prepping to be the same, because it’s clear that the same sort of planning techniques are used, and that ensuring your family has enough food to survive on, is at the forefront of their mind. There is a certain point where urban survival cannot be maintained long-term. So learning how to endure for as long as possible and picking up or adapting homesteading skills is one way to take preparedness to the next level. What steps are you taking to prepare? 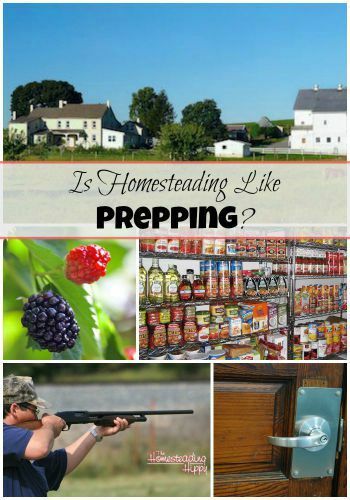 Do you think there is a major difference between homesteading and prepping? Though I think the point you made is a valid one, I don’t believe the difference can be marked so much in “being prepared” vs. the how and the why. Why and how preppers are preparing is on a completely different level than the why and how homesteaders are prepared. That’s not to say one is right and one is wrong. It’s always good to be at least minimally prepared for a disaster of some sort. it’s the true oxymoron of the deal, isn’t it? They both are alike in so many ways!!! homesteading” tends to get the song ‘Farmer in the Dell’ stuck in ones head. When asked if I’m a prepper (’cause that’s what they ask) I usually just respond that we prefer to live traditionally. If you think about it, I know you have, we are really just doing what every other generation before us has done right up until about our parents. Maybe I just don’t mind being called traditional:) Great post. I’ve noticed the military lingo a lot myself…and it was so confusing to me, too! I like the “live traditionally” answer as that really is what we are doing, isn’t it? so true!!! I think that each group really is part of the other in many ways! Excellent article. Thanks for sharing this with us on the Homestead Blog Hop. Great post! I’ve often thought about the similarities and differences, but never have seen it listed out in 1 place! Thanks for linking up with Green Thumb Thursday. We’d love to see you back again this week! We started out as preppers living in the city. When we moved to our homestead, it quickly became clear that homesteading is simply prepping in action, on a daily basis. They are quite similar. I think that a prepper should know homesteading skills. Should know how to grow their own food, can it and prepare it. They should be able to raise animals and much more. Wow! I have not thought of it that way. This gave me a new perspective when it comes to prepping. Thank you for sharing this! Great blog! I’m not sure which i am. I don’t have a homestead, i live in the city, have s big back yard that i plant veggies in (very visible street), get lots of comments on my garden. I began canning a few years ago, hobby canning i guess, but slowly getting into it more. I’m on property sites, but don’t really like the gung ho I’ll just taught what i need mentality a lot of them display. Slowly getting turned off by it, but… Still there for gathering knowledge. I think the two are a lot alike, but i tend to think the homesteader win be better if Becauseee they are self sufficient, true their food, sure it, hunt it, and are already living the life the prepper is preparing for. Shawn, from a prepping standpoint getting compliments from passers by on your garden would be a HUGE negative mate. Just think if things do go bad for whatever reason how many people that could be starving in three weeks know you have food. Your kind of in a situation where it would be feasible to encourage your neighbors to have fruit trees/bushes and little gardens as well, that way yall all have food if shtf. I have been doing that with my neighbors and have a small food forest that you can’t tell produces food at all, looks fairly overgrown from the street. Ironically I have some really nice landscape plants in it that look semi formal from the house, but the street view isn’t the greatest. Curb appeal is VERY overated, in fact I have blackberry, thorny climbing roses, loropetalumn, and elephant ear near the street to cut down on possible foot traffic and make it that much harder to get to the house if things did go bad “not too many people are going to crawl under a blackberry bush to take a crack shot at somebody thats behind a fence” also allows for me to point down our main to points of entry. I am more of a homesteader but I also think homesteaders don’t think as much about defense outdoors, nor do preppers ie when I pick peaches its easy, but how easy would picking those peaches be in a SHTF senario. How many people might be trying to poach my garden?